Student actors get cozy in this year’s Waa-Mu Show, “Gold.” The musical, centered around the 1936 Berlin Olympics, will open May 1 in Cahn Auditorium. Waa-Mu is set to open its 84th annual show, continuing an integral tradition of Northwestern theater. 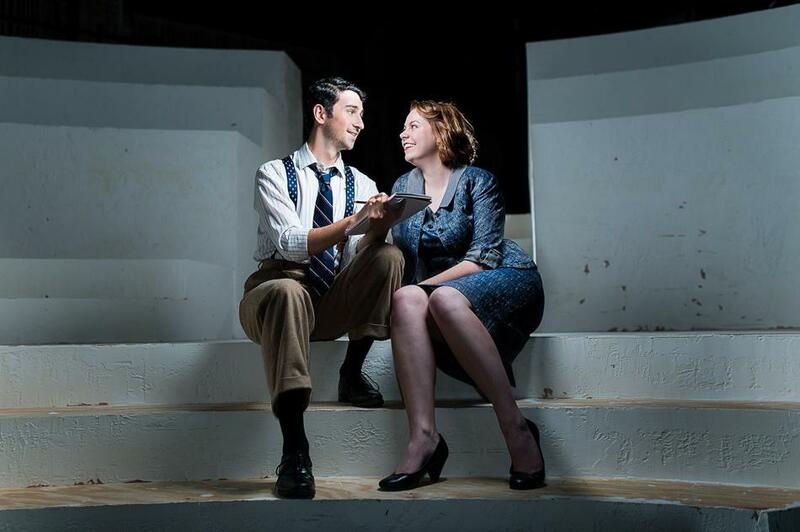 “Gold,” Waa-Mu’s newest production, tells the story of the 1936 Berlin Olympics through original music and writing. Composed, written, choreographed and produced by over 100 NU students, “Gold” aims to offer a historically accurate view of Berlin just before World War II and the unique qualities of the 1936 Olympics. Waa-Mu anticipates welcoming around 5,000 spectators during its run at Cahn Auditorium, including alumni. The show will run from May 1 to May 10, including special showings. Tickets will be $10 for students. Several events will be held during the days the show runs. May 1, opening night, will also be Wildcat Night and students will be able to purchase tickets half-off online with a code. Waa-Mu invited alumni of the show to Alum Night on May 2. Upwards of 50 alumni, including former co-chairs of the show, are planning to come, said Communication senior Kylie Mullins, co-chair of Waa-Mu. Waa-Mu will invite the Greek community to see the show May 8 for Greek Night. The chapter with the most members present will have money donated to its charity. Writers first got the idea for a show around the Olympics after Communication Prof. David Bell, director of the show, told students last year he had choreographed part of the 1992 Olympics in Barcelona, said Bienen junior Jon Bauerfeld, co-head writer for Waa-Mu. The show will focus on the events of the 1936 Olympics while also exploring the social conditions of pre-war Germany. The story follows the narratives of four groups of people — the United States basketball, swim and track and field teams and a group of journalists — as they travel from New York to Berlin and compete. The project was not without challenges as writers worked to accurately reflect the era, said Weinberg senior Hannah Dunn, co-chair of Waa-Mu. While the task was challenging, production staff was motivated by a fast approaching opening night, Bauerfeld said. Mullins said she is proud of the work the team has accomplished and is eager for students to see the final product.